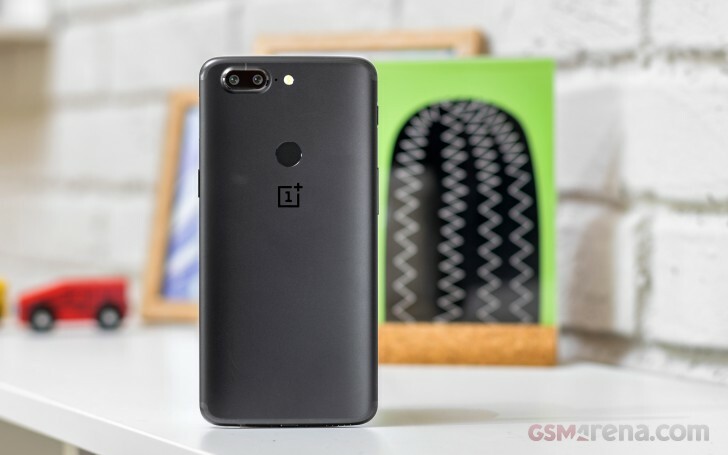 We get the reviewers' package, but inside it, there's a retail OnePlus 5T box. Only it says just '5' on top of the box and not '5T' and that led to some brief confusion in our unboxing attempts, settled by a tiny 'T' on the side. It's the little things, literally. Anyway. There's the phone on top, with a pre-applied plastic screen protector (which you can easily remove like we did). Underneath, you'll find the Dash charger and a cable for it, and that's it - OnePlus doesn't bundle earbuds, but does sell a pair for a reasonable $20/€20/£16. With a proper 3.5mm jack there's no need for dongles, either. 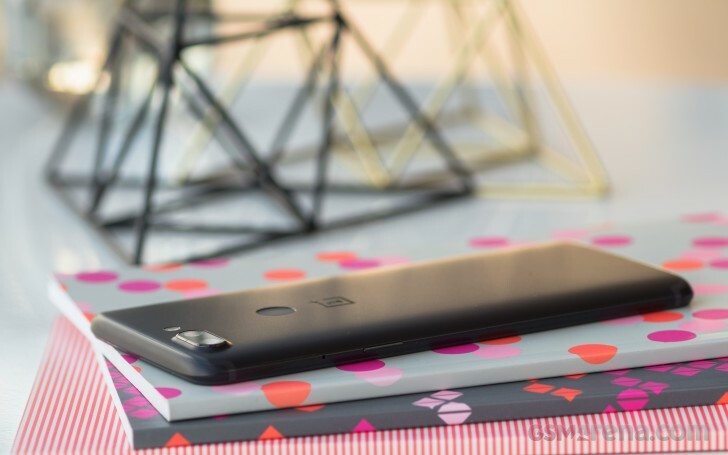 The OnePlus 5T measures 156.1 x 75 x 7.3 mm, and that's about what you'd expect from a contemporary 18:9 6-incher. The Pixel 2 XL is 1.8mm taller (but remember - it's got stereo speakers! ), while the LG V30 is more compact - to the tune of 3.4mm. Which is precisely by how much the Galaxy S8+ is taller than the 5T, but its display is 6.2 inches corner to corner. The Mate 10 Pro, meanwhile, is 1.9mm shorter than the new OnePlus phone. There's more variation when it comes to weight, and the OP5T is on the light side of the spectrum with its 162g. The V30 is the only lighter one here (158g), with the others hovering around the 175g mark. 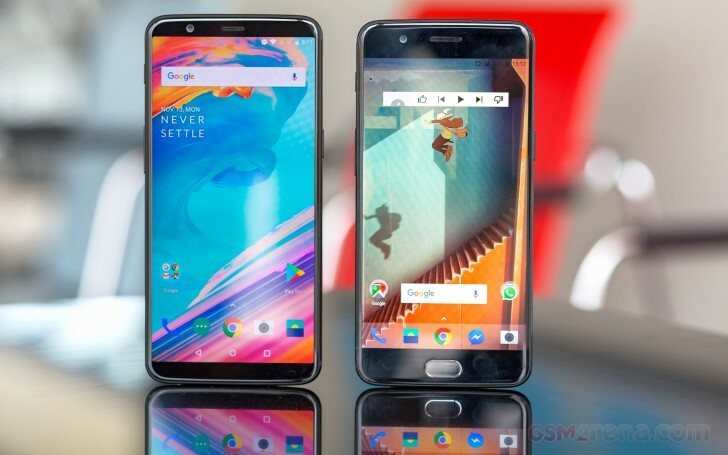 The OnePlus 5T is visually a very similar device to the one it replaces, and that's not a bad thing. Only available in Midnight Black, at least for the time being, the 5T is a stealthily stylish piece of kit. The aluminum back has a silky smooth finish that's maybe a little too slippery. 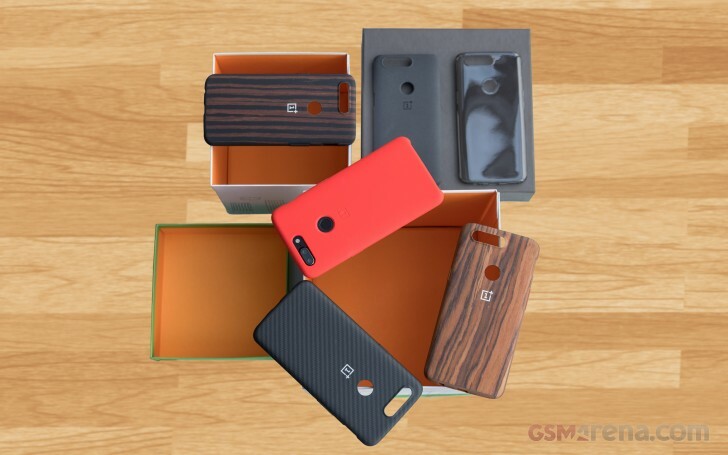 If you're the clumsy type, do pick up a case - OnePlus has a whole range, including the iconic sandstone one. We seem to be big fans of the soft, bright red, silicone one in particular. The rear-mounted fingerprint reader makes the OP5T look a lot less like a Plus-sized iPhone - combined, of course, with the fact that this year's iPhone 8 Plus has a glass back, unlike the metal 5T. The fingerprint sensor is very conveniently located - along the central axis, above the midpoint, but not too high, well within reach of either index finger - 2017 Galaxies can learn a thing or two. Some say that it's the perfect spot for a fingerprint sensor altogether - not that the whole bezelless fad leaves many options. There are two ways to go about antenna bands - try to hide them, or make them a design accent - and both approaches can be made to work. OnePlus' way of dealing with them is one we really liked on the OP5 and it's the same here - you'd almost have to look for them on purpose to be able to see them. The 'Horizon' line that circles the entire phone, a design element from the OnePlus 5, is here on the 5T as well. Where Google went with flat sides for the Pixel 2s, OP chooses thin, horizon-like ones, and it does make for a substantially sleeker profile. It's almost like the $500 OP5T has a more premium vibe than the $850 P2XL. Makes you wonder what part of the price difference accounts for the Pixel's dust and water resistance. We've had a beef with OnePlus for a while for not going the extra mile and securing an IP rating - sure, that one guy on the internet may have torture tested the OP5 and found it survives being dipped in water, but it sends a whole different message if it's in the specsheet. Just like it is on the Galaxy S8+, Pixel 2 XL, V30, Mate 10 Pro, HTC U11+, Xperia XZ1, and iPhone 8 Plus. All of the flagships, really. On the front, the 6-inch display dominates - that was the whole point of the T's existence in the first place if we're not mistaken. The panel's corners are rounded just a bit, nothing dramatic like the V30 or the Pixel, but it's still a nice touch. Seriously, if you're doing the 18:9 thing, you'd better round them corners at least like these guys did - Huawei and HTC didn't get the memo. 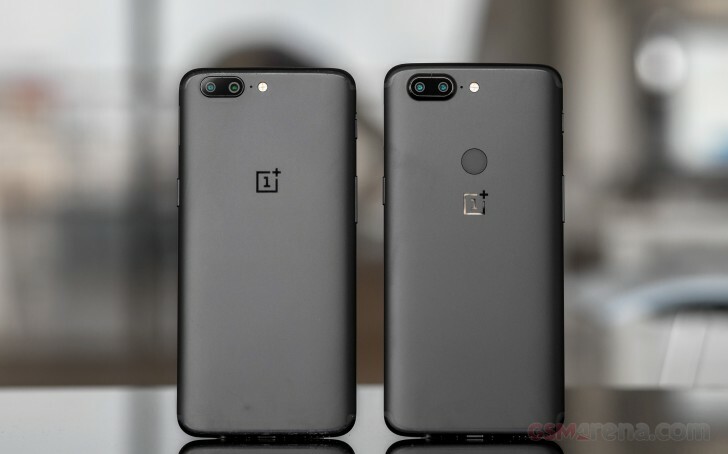 There is a fraction of a millimeter more bezel on the sides of the OnePlus 5 than the outgoing model, but that would just be nitpicking. The chin and forehead are smaller, and that's what matters. Above the display, there's the usual bit, and pieces, including a notification, LED to the left - particularly handy on the 5T that lacks an always-on display feature. 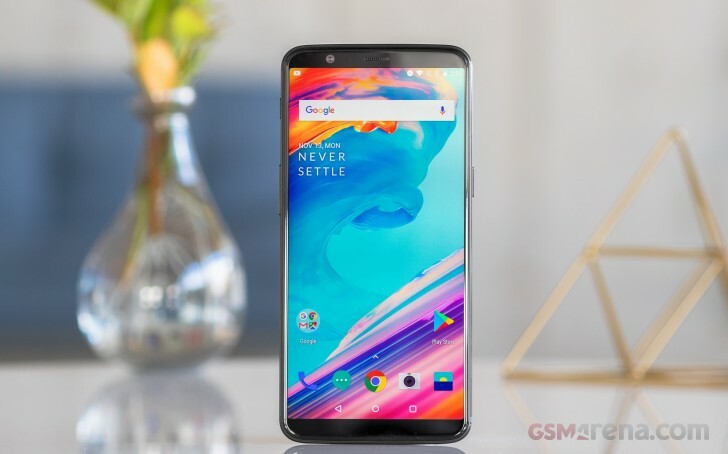 We just wish OnePlus had fitted a second speaker on the 5T, some of the competition has managed to find a solution with little to no trade-off in terms of footprint. It's just a single downfiring speaker here. A lot of that same competition, however, has been ditching 3.5mm jacks, and that's a major no-no in our book - Huawei, HTC, and Google are guilty as charged. Well, OnePlus one-ups them - the universal headphone jack is here for another generation. And because we can't have it all, the 5T's USB-C port only supports the USB 2.0 standard - you're getting the reversible connector, but not the transfer speeds of USB 3.1. Oh, well. The OnePlus 5T's card tray only takes nanoSIMs as there is no option for storage expansion. If the base model with its 64GB sounds limiting, you'd better invest in the 128GB version. Why the war on microSDs, we still can't fathom, though it would actually have been a surprise to find a memory card slot on the 5T since OP isn't known for fitting those. What OP has been know for is its three-position alert slider. It lets you quickly and easily select between silent, do not disturb and ring modes, with a nice tactile click. We can't think of another droid, current or recent, that has one of these. As for the other controls, the power button is long enough, if a little too thin, and it and the volume rocker both click positively. The 5T feels compact - as recent 6-inch phones go, that is. The sloping back and the thin sides are pretty good at leaving the impression you're holding a smaller device.